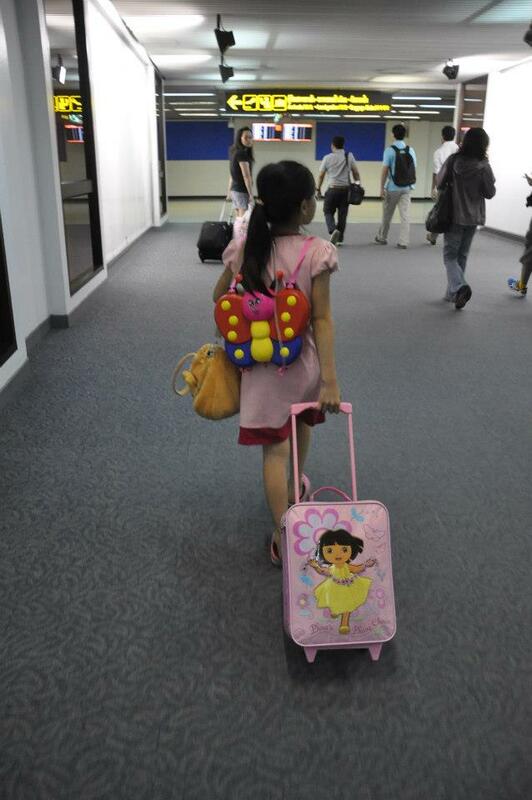 My almost 9 year old kid embarked on another Bangkok trip alone, with her aunt and friend. This time around, it was a 11 days trip that sent her little sibling crying buckets. Both of them talked over Skype everyday. "I want you to come back tomorrow. "I am very bored now. Every day is no fun. I miss you", my little one said to her older sibling. They are very close, so close that I am still very much in awe as I don't think I have experienced this strong bond among my siblings. 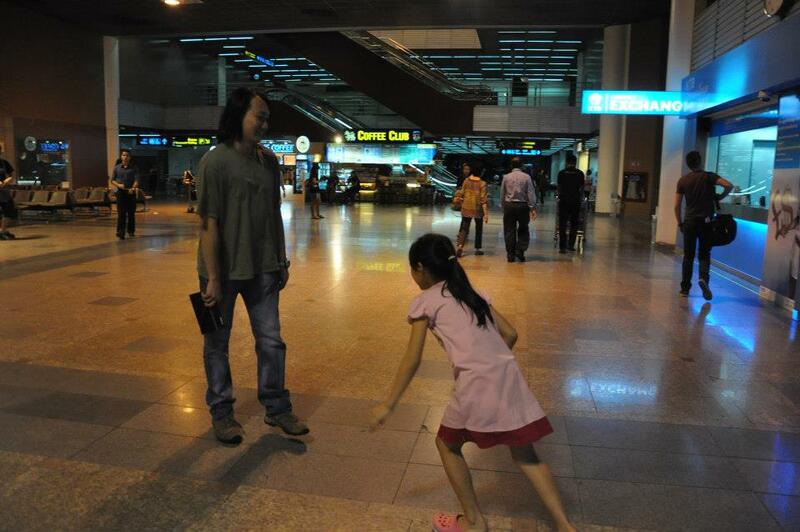 She was excited meeting her deary friend in Thailand. Nowadays, quite a lot of times, my two children cook with me. It was really fun, preparing the food and eating together. Cooking is part of homeschooling, part of life. I must say, it gets easier when the kids are older. Before this, it was mostly my little one who helped me out. She was very curious in everything I do and love to be part of it. For any young child, it is fun to be able to do what the adult does. She also said "Folding clothes is so fun." Chores to her is natural and part of life. My older one was not so lucky. When she was young, many a time, she wasn't invited to join in as I felt that doing the chores alone is much faster and more convenient. And when she got the chance to join in, I "taught" her how to do. This made her felt like she couldn't do it well on her own and I took away her natural in-born exploring ability. I retreated to my bedroom, trying to have a quiet afternoon and recuperate from the madness of Legoland trip, volunteering at Raptor Watch and having En's childhood friend over for 3 nights, with all these occurring back to back. Shortly, I dozed off and awoke knowing the dinner was prepared and our piles of clothes folded. I was touched by the kind act of my little children. I am blessed. And the most touching moment, was my older child cooked the dinner for us all by herself. I have been patiently waiting for her to regain her confidence in cooking which I have taken away. Here is En observing EL talking to kids passionately about "Green Living." 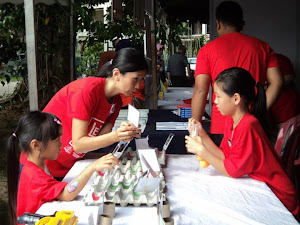 My children were invited to volunteer at Malaysian Nature Society Raptor Watch event. I am so thankful of this opportunity and trust given by EL to them. (EL, thank you very much.) This is the first time in my homeschool journey that I was not questioned on how homeschool can work out and if my homeschool children are weird. EL thinks highly of them and even more highly than I do. The children mixed well with other volunteers. They are more outgoing and braver than me. EL didn't seem to mind this young volunteer being distracted and away from the booth she volunteered in. I kept silent and let her go with the flow. After lunch, Hui finally remember she was here to help and went to the table and helped. Again, Hui was distracted by the "limbo rock" game going on and on in front of our booth. This is living room where we all bunk in at Casa Rachado. We shared the apartment with two other families. We have a nice view of the sea and a very clean beach. We came here with 4 other mothers and their children. As it was a Thursday, there wasn't any crowd. The kids got to ride multiple times on all the rides. It isn't hard to make a decision to homeschool, knowing we have all the flexibility and freedom in life. My younger Hui went up the roller coaster for the first time. Her height was just below the line of the minimum height requirement and the staff kindly let her in. Seeing her so sure of going in, I trust her and let go of my worry. She came out smiling while saying it was so fun. I thought she would also take the second roller coaster which was much lower and not as fast. But it turned out, she didn't want it but observed from a far. I didn't want to tell her it is not scary where usually parents will do so. I think it is scary to me. If I have the choice of not going up, she should have hers as well. Then, little Hui took this one and others ride that followed. This assured me that she knows what she can take and how far she wants to go. There is a playground at "Lego Kingdom" for young children within the vicinity of the rides for older children. I had a good laugh seeing all the different facial responses to all the nine children on this ride. That shows that every person feels different toward one same ride. Hui decided she had enough after one try. I think vertical height must be something very different from fast rides that go horizontally. She would take the latter multiple of times and not the former! I can't feel the different as I never comfortable trying it. Lego Mind Storm workshop for 8 year old and above. L registered us for the 1 pm workshop which was a wise move to avoid the hot sun after the 12 pm lunch. I like this one the most ( I didn't take the ride). It has water splashing hence it was cooling to play with under the hot sun at 2pm. It is located across the Lego Mind Storm workshop. We didn't spend a long time at Mini Land as we tried to cover all the rides. The show at 3pm to avoid the passing drizzle. 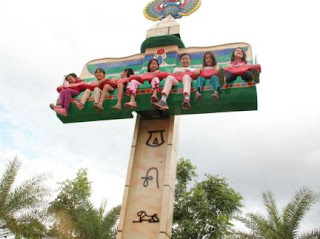 Looking at the photos, I observed how the children took a ride with any of their friends and they simply played with anyone and never choose side. En rode on the car happily. Hui felt she wasn't sure if she could ride on this but went on the car and stepped on the pedal after some persuasion from the staff. She told them, she can't do it and walk off. She went to the smaller cars ride instead and still wasn't sure. Her car was stucked at the curve and she walked out of the ring. Then I saw she observed from afar and after a short while, she told me she is going to give it another go. Then, I saw her riding many rounds comfortably. During the process, I didn't utter a word and just listened to her and nodded with how she felt. The ride that goes around and around is one of the favourite for my children. Another playground at "Land of Adventures"
Jabatan Perhilitan office is situated on your left before the main gate to Taman Negara Sg. Relau. Over here is where we applied for the permit(RM2) to camp. 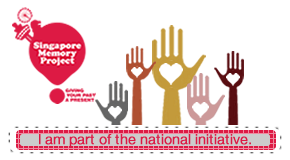 The camping charges is RM3 per person per day. The campsite is on the right side(photo below) whereas the chalets are located on the left. We camped next to the river, Sg Relau. The kids love it here. And me, I love the quietness where animal (Siamang, Hornbill etc) sounds can be heard loudly. Bathroom, prayer hall and a canteen. The river where the kids played in. Hui and her friend played under aunty C's cozy hammock. There is a hut next to my tent which provides shelter. En got so many scratches on her legs from climbing this tree. Camping at the basement of a one-room apartment at Genting View Resort. It was such a cooling and quiet night. The only sound we heard was the water gushing from a nearby small waterfall. To camp here, you need to book the one-bedroom apartment that comes with a small living room and small kitchenette.